As a longtime farmer, I work hard to ensure that food I sell with a U.S. Department of Agriculture (USDA) certified organic logo lives up to that label’s stringent standards. And I know the vast majority of organic farmers, processors, and handlers are equally committed to adhering to those high standards. The value of our business depends on customers trusting that they get what they pay for. That’s why I’ve been infuriated and troubled by recent investigative reports revealing gaps in the organic certification process. These articles have suggested that milk from a major domestic producer as well as imported corn and soybeans have been sold as certified organic, even though they reportedly failed to meet the USDA standards for that coveted label. Stories like this should sound an alarm for Congress and the USDA. Failing to uphold the organic standards could blow a hole in one of the fastest-growing areas of agriculture. Inaction also harms certified organic farmers who are helping to grow the rural economy in states like mine by using the label to draw buyers and remain competitive. Meeting organic certification standards costs farmers time and money. For instance, Abby Sadauckus and Jake Galle raise a variety of certified organic livestock at Apple Creek Farm in Bowdoinham, Maine. Among their expenses for meeting USDA standards are organic feed for their livestock—which costs them about 50 percent more than conventional grain—annual certification fees, and inspections. When we allow rule-breakers to sow seeds of doubt about the organic label’s integrity, it hurts farmers like Abby and Jake who are committed to organic practices. It also jeopardizes the future of the industry as a whole. Consumers are willing to pay a premium for certified organic products because they value the sustainable practices that go into them—but only if we can keep their trust. While maintaining the integrity of the USDA organic label won’t require a total change of the third-party certification system, a number of steps are needed to strengthen the system. One is establishing clearer standards. Too many grey areas have allowed for their inconsistent and widely varying application. A new organic animal welfare rule, for example, would clearly spell out how livestock and chickens should be treated to ensure their health and well-being throughout life, including transport and slaughter. In the making for about a decade now, this rule was recently delayed by the Trump Administration right before going into effect. It’s also clear that USDA must strengthen its oversight of the organic certification process, and they need the resources to do so. The agency charged with this responsibility—the National Organic Program—has a paltry budget compared to the size of the industry. And things could get even worse. The Trump Administration’s budget proposal would cut the agency by 11 percent and leave three vacant positions unfilled. Last month, I had the chance to ask Secretary of Agriculture Sonny Perdue about those cuts. While I appreciate his pledge to “double down” on enforcement, I don’t know how it can be done with fewer resources. The budget proposal also eliminates funding for the Organic Transition Program and the Organic Cost-Share Program, both of which are vital to helping farmers make the transition to certified organic production. Amid a draconian budget proposal that hits many people very hard, these cuts may seem insignificant. But to me they seem especially foolish and shortsighted. Organic food is arguably the biggest market opportunity in our agricultural economy right now. The Organic Trade Association just reported another record-breaking year for the industry, growing more than 8 percent and posting $43 billion in 2016 sales. These sales benefit certified organic farmers who have reported increased revenue and new jobs in rural economies that very much need them. But keeping up this positive trend means maintaining the integrity of the organic label—something the Trump Administration and my colleagues in Congress would be wise to get behind. 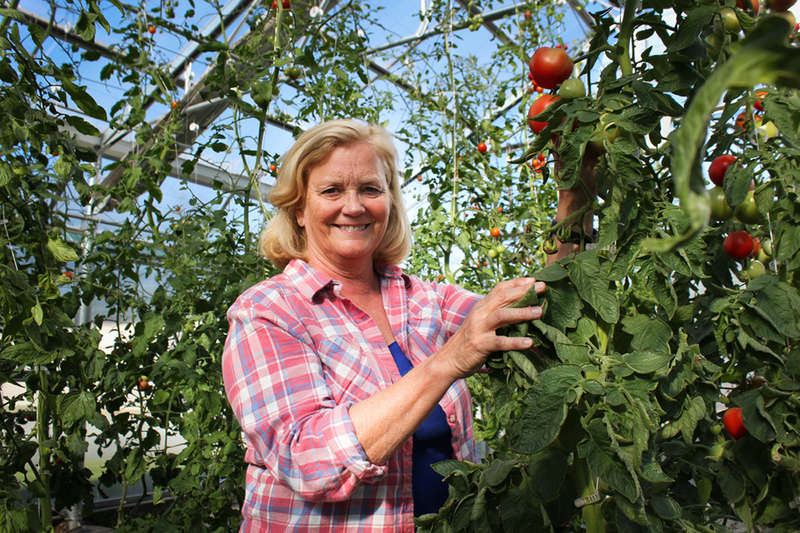 Congresswoman Chellie Pingree (D-ME) is a member of the House Appropriations Subcommittee on Agriculture and owns Turner Farm, which grows certified organic vegetables, herbs, and flowers, and produces pasture-raised beef and pork. All true, but missing a major point. Organic farming is FAR better for the environment, for our nation's health, and even cheaper for our healthcare system. A politician won't say that, but I will. I absolutely agree with you. What I have a serious problem with are companies in Maine that have "Organic" in their company name but sell sludge. Many people don't know to ask where it comes from or ask outright if it's sludge. Many people are putting this on their vegetable gardens thinking their adding healthy compost to their garden. I think if a company is selling sludge they should be prohibited in putting organic in their company name. Trump's rural prosperity plan is focused solely on GMOs and forcing other nations to buy them. This administration could care less about organics no matter how hot the organic market becomes. Is a sad situation. What about seeds from non-organic neighbouring farms blowing onto certified organic farms? How can we protect those farms and farmers and our certified organic products? Many thanks for this clear and timely call for bipartisan action to protect and strengthen organic integrity. Acting now can prevent harms to all of the thousands of organic farmers, who do work very hard everyday to ensure that they are living up our hard fought for organic standards and to the growing numbers of loyal customers who count on us to keep getting this right. It is essential that organic regulations continue to be strengthened in transparent and timely manner to remain ahead of many challenges that come with rapid industry growth. It organic certification and have the resources to accomplish this goals. As a cancer survivor organic is very important to me. Thank you for your efforts! Thank you for looking ahead and at the big picture. Organic foods are extremely important, hopefully others will realize the importance of sustainable farming and "clean" animal husbandry. Agree wholeheartedly. Organics is the fastest growing segment of the farming economy and it is creating jobs - good jobs. Organics spur local economies, create healthy eaters and smart consumers. All good. Protections and enforcements should be expanded not reduced. Any petition or call to a politician that I can sign or contact. Please put my contact info on that list. Organic farming needs to have tight restrictions. Organic is threatened on all sides. I am a personal friend of Jon Tester and have been an organic farmer until I retired so I want the standards for Organic need to be kept good. So keep pushing to keep them good. I am beyond ecstatic that someone is finally speaking up about this!!! As a committed organic consumer, I am DEEPLY TROUBLED by the USDA's lax oversight of the huge companies that have purchased smaller organic companies and turned a blind eye to the changes that are threatening the organic label. There is a REASON why we pay more for organic - it is WORTH IT. And as more people understand that CHEMICALS AND PESTICIDES ARE NOT HEALTHY FOR US, they will hopefully appreciate the efforts of organic farmers more! I say, let ALL farms become organic and let us go back to the future with small local organic farms and end the abuses of CAFOs. Thank you, Congresswoman Pingree! I learned to read so that I can understand things and to be educated. I want the organic label to mean something real, not to be a just story of what might be. Please, do all you can to protect our food. Thank you. Please keep fighting for clear and truthful labeling of Organic Foods. It is imperative to the health of our nation that we keep organic foods clean and safe and readily available to all. No GMO's or pesticides ever. Thank you for your diligent effort towards maintaining and improving the integrity of organic farming practices. I can not express how much I value your efforts in this area and hope to see you and other like-minded people advance this awareness and support. We must support organic food, because we cannot continue to poison ourselves and future generations. Organic food needs to be properly labeled and properly regulated. We all know of someone who lies to get ahead or make money. This must not be allowed to occur whenever possible (by regulation and labeling). Genetically modified organisms must be properly listed and labeled. It is unacceptable to allow GMO to escape into the wild, and that is exactly what has happened. Since this technology is new, it is not scientifically tested, yet is being deployed anyway. STOP using GMO until it has been properly studied. A few studies in a few years is insufficient data to allow this practice to continue. restore transparent qualifications for organic farming. keep the quality of the earth pristine. thank you. It's my impression that the agricultural chemical industry has most of your colleagues, the USDA, the EPA and possibly Trump under its spell. It's unclear what we can do to break their hold. I sign petitions seemingly to no avail. Any suggestions? I NEED ORGANIC MEATS FOR MY HEALTH. DOCTORS NEGLEGENTLY, RECKLESSLY MIS-PRESCRIBED ANTIBIOTICS IN FLOROQUINOLONE FAMILY, DESPITE NO INFECTION. CAUSED SEVERE ADVERSE REACTIONS/DAMAGE TO NERVES, TENDONS, LIGAMENTS & GUT INFLAMMATION. LEFT ME IN CHRONIC DAILY PAIN FOR OVER 20 YEARS. IF I EAT NON-ORGANIC MEAT OR MILK, ALL THAT PAIN IS EXACERBATED. DOCTORS & PHARMACIES WERE RESPONSIBLE FOR RECKLESSLY PRESCRIBING & DESPENDING. ORGANICS ARE ONLY WAY I CAN EAT NUTRITIOUS FOODS. ACCURATE, STIFF ORGANIC LABELING IS REQUIREED OR I SUFFER & AM FURTHER DEBILITATED. YES, I AGREE, BECAUSE EATING AND DRINKING ONLY ORGANIC FOODS IS ONE SURE-FIRE WAY ONE IS EATING AND DRINKING HEALTHY FOODS AND DRINKS AS ORGANIC HAS NO HARMFUL PESTICIDES, HERBICIDES, FUNGICIDES, ETC.!!! People depend on knowing food is certified organic. it is the only way to ensure a truly healthy diet. please plesae plesae do not corrupt and pollute the label by rolling back all safeguards. "Certified Organic" allows consumers to have confidence in what they are buying and to have faith in the "truth in labeling" of a product. Don't mess with our food. Leave it the way God meant it to be. This is important to me whether I'm living w/MS or not. Our food industry is in the garbage b/c a lousy toxic corporation has been enabled for decades to compromise our environment, food industry along with our health and well being!! Organic is important b/c it's supposed to be cleaner and better, so I want it to be protected as much as possible! I buy as much Organic foods as I can find and afford. I DO NOT want to eat ANY GMO foods. I want to know what I eat. thank you for speaking out about maintaining strong USDA regulations on our organic food industry. Biodynamics & future organic farming systems are going to be the key to keeping America healthy! It can be done! . We have a choice to do it right. We also need to teach our scientists how to communicate better in layman terms .so that congress better understands the importance of keeping chemicals & pesticides out of our food.